Even when Greg Johnson finds himself in the middle of nowhere, he knows exactly where he is. The man they call the Tornado Hunter has criss-crossed hundreds of thousands of kilometres of roads through the Canadian prairies and America’s midwestern states chasing storms and documenting the aftermath by way of video and photographs. Johnson travels with two companions when he’s in pursuit of the next twister – one man behind the wheel and the other keeping an eye on the weather cells on a computer. Johnson handles the navigation through a GPS system on his laptop (Microsoft streets and trips), which allows him to view his surroundings in 2D and at greater distances (more than 50 miles ahead). Whether it’s asphalt, gravel or dirt under his tires, Johnson is heavily reliant on the web of roads to deliver him to the eye of a storm. “Our road network is, by far, the most important part of storm chasing,” Johnson said after his keynote address to the gathered crowd at the Saskatchewan Heavy Construction Association Fall Convention in Regina. Johnson’s hair literally has been blown back on several occasions – he needs to get close enough to the storm to secure the perfect snapshot. That’s not to say he hasn’t been too close. If anyone would know, it would be Johnson. An average chase day sees he and his team log anywhere from 800 kilometres to more than 1,000 kilometres. Slower days when the crew isn’t in hot pursuit they’re laying rubber to road in an effort to cross paths with the next weather system in neighbouring states or provinces. The devastation Johnson experienced in Joplin, Missouri in 2011 was the worst he has ever seen. The EF-5 tornado killed 158 people and injured 1,150 and was the deadliest tornado in the U.S., since 1947. The twister in Joplin boasted impressive wind speeds of more than 320 kilometres per hour. Damage from that storm was pegged just shy of $3 billion. 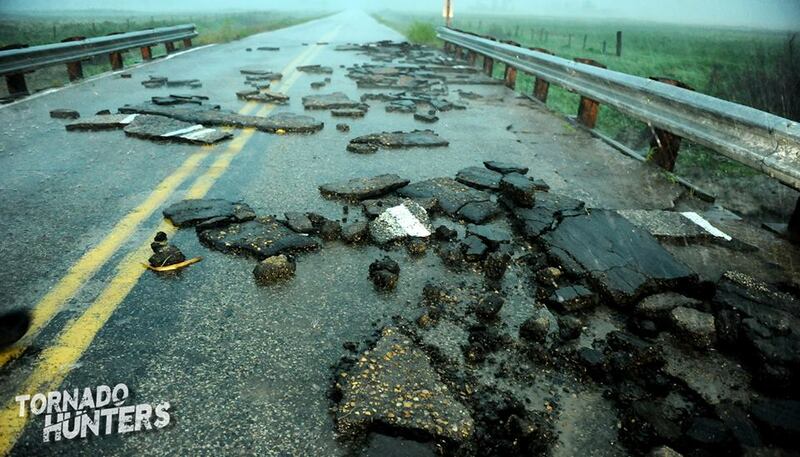 Perhaps, though, one of the most telling signs of destruction occurred a few years ago when Johnson documented an intense tornado near Pierson, Man., where he photographed asphalt from a highway that had been sucked up and spit out by the powerful storm. Massive chunks of highway left strewn along the side of the road after the twister had passed. Countless hours spent by road builders was all for naught. Poverty and reliance on roads were the biggest takeaways for Johnson and crew after Hurricane Harvey made its way through the Texas Gulf coastal communities. Tens of thousands of residents fleeing the cities in Harvey’s path lined the interstates and caused bottleneck traffic snarls for miles. Johnson, though, sped in the opposite direction toward the storm. A reliable and efficient network of roads and highways allowed each to get to their desired destinations. “That’s what they’re designed for… maybe not that kind of volume all at once, but those interstates are impressive pieces of infrastructure,” Johnson said. And what greeted him when he arrived in south Texas is something he won’t soon forget. Johnson’s wealth of experiences and stories and thousands of eye-popping photographs from storm chasing has turned into a profitable career. He travels across Canada teaching photography classes and engaging audiences – much like the one at the SHCA convention – as a guest speaker. All of this wouldn’t have been possible had it not been for the network of roads and highways he travels on a near-daily basis each spring and summer.